Quote Reply Topic: Life goes on ! This blog post is translation of an article published in marathi daily 'Loksatta' under column 'Ghatmathyavarun' on 19th April, 2017. As I reach the house, I can see around me the usual pastoral scene at dusk. The men returning from their farms, women getting the food ready. I have reached the house of Ullusha Bhoye, a large and happy family with children and grandchildren. They are all Malkaris (Malkaris abstain from alcohol and non-vegetarian food and usually participate in the Vaari, the annual trip to Pandharpur). I have the usual dinner of bhakri and pithla and sit on the cot in the aangan surrounded by the early night sounds. Children playing, while getting ready for bed, men talking, women closing the kitchen for the night. I sit there and think back over the past few days. A few days back I took leave of my new friend- The Satpuras. I thought of Mandwa, a market place in the Satpuras, and Daab, a place of religious importance for the adivasis, since it is believed to be the abode of their goddess Yaha Mogi. In their tribal language Bhillori, Yaha means mother. I remembered the ghat that led me from Daab to the plains below. It was scenic and beautiful and as I climbed down a considerable distance, I could see far away to the south, shimmering in the haze, a blurred line on the horizon – and I felt a thrill run through my body! Sahyadris! The small village of Haldani, the mild mannered people there, and the overnight stay at the pastor’s place. My surprise at the villagers, who are placed financially in relatively much better position, are relatively better educated, have small families with two children. I tried to remember all the various languages that changed with the changing geography. In Satpuras - Pawri, Nuiri, Bhillori, on the plains Dehavli, towards Sahyadri Mavchi Gavit, which is also spoken in Nandurbar and also in Dhule on the Sahyadri plateau, but in a different dialect. Not that I could understand the difference, since these adivasi languages were totally new and incomprehensible to me. 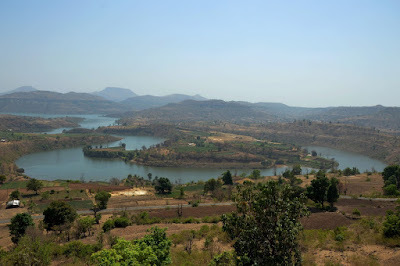 The small Khose ghat, that led me from the plains to the Sahyadri plateau and had me winded with its twists and turns. The journey from Haldani village to Khose ghat, through the semi deciduous jungle, with no breezes, stifling, leaving me hot and tired and parched, longing for a drink of cool water. The stay at Salher at the foot of the Salher fort, with Sunil Bhoye. My friend Rohit had given me his reference. Sunil’s father Kashinathdada was a mine of information on the region around. 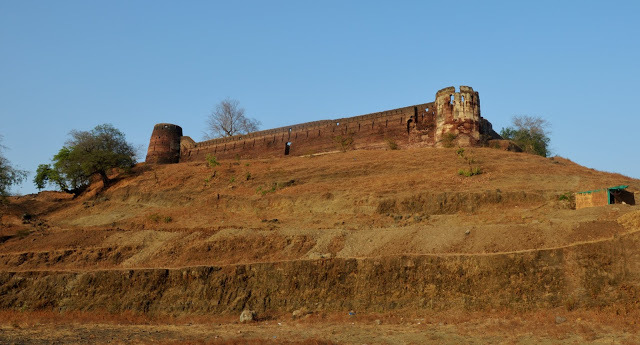 When Rohit was working at the Salher fort for Durgapratishthan, he got to know Kashinath dada and plagued him with questions about the fort and the surrounding area. Rohit later wrote a book on Salher fort named Salher Takht, an excellent example of local knowledge and urban education coming together. Thus I landed here at Ullusha Bhoye’s house in the village of Suple Dighar near Arjunsagar dam. He is the brother of Kashinath dada. With this thought I came back to the present. I suddenly realize, it is a beautiful moonlit night, fragrantly silent. I lie down on the cot feeling the warm, coarse touch of the blanket below. The family members are getting ready for bed. The youngest granddaughter of the family is asking her grandmother to sing a lullaby. And the grandmother starts singing in a sweet melodious voice. She is singing a folksong, asking God, addressing Him by His various names, where do we find Him? Where is His abode? The child listens and repeats the song as and how she can in her young, childish voice. Though she is getting the words wrong, she gets the melody right. As I drift off to sleep in these old mountains, surrounded by these simple loving people, I think about how these age old traditions, wisdom and lessons of life are passed on from one generation to the next. Of how life goes on !